Welcome back after the Easter break – we all hope you have been enjoying the long-awaited arrival of the sun and warmth this week! We are joined by another Oliver this term and he has already begun to make new friends thanks to the children making him feel welcome. Olivia, Ottilie and Mabel also shared their wonderful news of the arrival of new babies – Clemmie, Willa and Ned – congratulations to each family. Thank you to everyone who attended this event – we saw some wonderful creations and it was a pleasure to see so many mums, dads, grandparents and friends come along to watch and enjoy this traditional end of term event. Thank you to everyone who supported these two events. The Quiz Night was great and thankfully the staff team won!! We also raised some valuable funds for nursery – nearly £500. The Mud Run was fabulous too and a huge thank you to Alex Bignell for all his hard work putting the event together – we are already looking forward to the next round. The staff crew must say a very big thank you to Tasha for being our representative – we’re really pleased she did so well because now she can represent the staff each time……!! Prêt a Portrait will be visiting us on Tuesday 15th May to take individual photos as well as our traditional Leavers photograph. The Leavers photo has always been a special memento for those moving on to their next schools and we really would appreciate it if you could arrange for all those children leaving us in July to come into nursery on the morning, wearing their nursery uniform please. The children are photographed in small groups, and these are then joined together to create one large group photo (an example of which will be in reception) which we do hope you will purchase. Our other children are welcome to come in if not their usual day, to have individual photos taken but parents will need to stay with these children and take them home once the photo has been taken – this will be after all the leavers photos have been taken. These will then be made available to order through Prêt a Portrait’s website – details of which will be circulated shortly after the photo shoot. A sign-up sheet for photos will be available in reception. A sheet will be available for volunteers to add their names against specific tasks and Kate will discuss roles in more detail. Our annual trip to West Wittering will be on Thursday 7th June for all children. We leave from the village hall by 9.05am, spend the morning on the beach, have a special lunch then return to Grayswood by 2.45pm. A letter with additional details and booking form is being distributed w/c 23rd April and we request that forms, and payment, are returned by 8th May so that we can organise staffing and catering. Our last day of the summer term is also the last day of nursery for many of our children and we host a big celebration of their achievements before saying goodbye to them as they head off to their next schools. Please put the date in your diaries – Friday 20th July – for all our nursery children (not just those leaving us) to come in for 9.05am in order for a short practice of our play. Families and friends are encouraged to join us from 11.00am to watch the performance and to wish our leavers well. We aim to do this in the woods, but this is weather dependent, so confirmation of the venue will be made much nearer the time. We hope to see everyone come along and stay for family picnics after if the weather is being kind. We will be holding a big family camp out event on the weekend of 22nd – 24th June. We hope you will come and enjoy the weekend with us. More information soon but this is going to be a great weekend so pop it in your diary. It will be open to anyone to join us so perhaps you would like to gather some friends? This term, especially, it is important that all children come with NAMED sunhats and water bottles. We are unable to apply suncream, so please apply cream to your children at home before they come to nursery. The children will be kept in the shade as much as possible, but, of course, they love to play in the sunshine, so need to be protected from the rays and kept hydrated. We remind the children at registration time and throughout the day. Thanks for your co-operation. As you have read above, this is a very busy term. Many parents take holidays whilst it is possible to do so outside the school holidays so please do let us know in writing, in advance, if your child will be absent from nursery for a holiday, or for any other reason, and include the dates they will be absent. We have a statutory duty to know your child’s whereabouts if they are not at nursery as expected. But more than that – it helps us plan our timetable to the children’s great advantage. Many thanks for your help in this regard. These were distributed at the end of last term and were due for payment by 16th April. Thank you to those who have settled their accounts. Any outstanding invoices should be paid now please unless you have made alternative arrangements with Kate for payment. Sadly, due to the cost of chasing unpaid invoices, we will reissue on 30 April with 10% surcharge as is noted on the invoice. 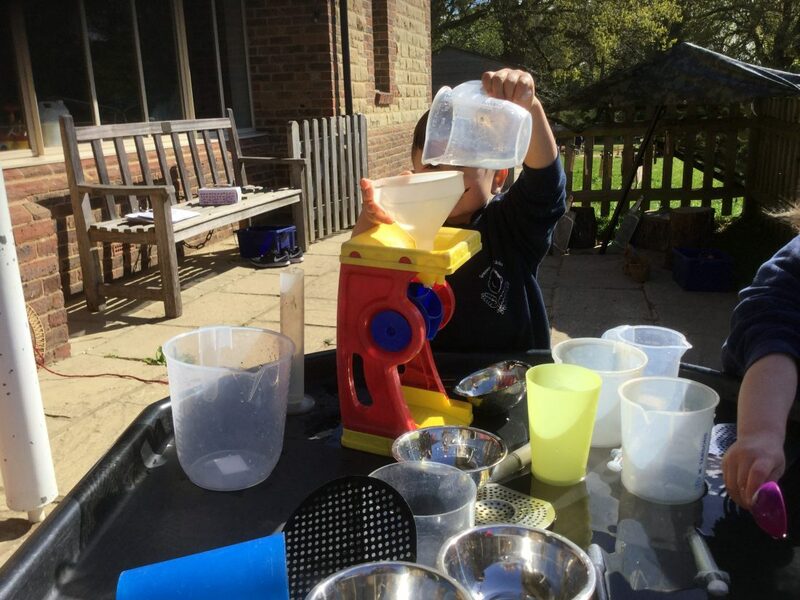 A new rota for the summer term is available in reception for you to sign up – we hope as many of you as possible can join us for a day or two over the coming months as the children love to have their parent or carer share in their nursery experiences. This will be the final term for many of our children and is the time of year when we pay special attention to helping children prepare for the new challenges ahead. Our older children have already begun to change into a PE kit and this term will be changing into full kit when taking part in Miss Maureen’s sessions. Please help us support the children in this useful skill by ensuring they have a PE kit in nursery every Monday. Children will still head to the woods in their red dungarees, but we recommend, on especially warm or hot days, that children wear light weight, long sleeved, t-shirts to keep bugs and potential stings and scratches away from bare arms. NB The e-mail address is not accessible to staff whilst the nursery is in progress. There are currently eight members of staff on the team each of whom works on different days as shown below. We also have Miss Maureen on Mondays for music and movement and Bollie for Playball on Tuesdays, with Steph Peat as our lunchtime supervisor. The Nursery is not a place for poorly children. We are a learning environment and your child needs to be well in order to engage in their learning. If your child has been sick or had an upset tummy they must remain away from nursery for a minimum of 48 hours and not return until they have had a normal (for them) stool. As a general rule, children taking antibiotics should not be at nursery. Please ask us if you are unsure when your child should return to nursery after an illness. Please do not let your children wear jewellery to nursery or bring small toys etc. As a guide children should not bring to nursery items which could fit inside a traditional 35mm film container.